Here’s a stitch dictionary that I’ve had on my shelf for ages. For some reason, I pulled it out the other day, and golly, I’m glad I did! Now I remember why I bought it. It’s a great little stitch dictionary – simple, uncomplicated, colorful, informative… and fairly inexpensive. 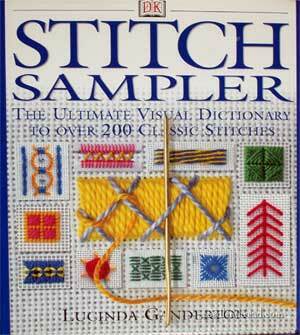 The book is called Stitch Sampler by Lucinda Ganderton, and published by DK Publishing. 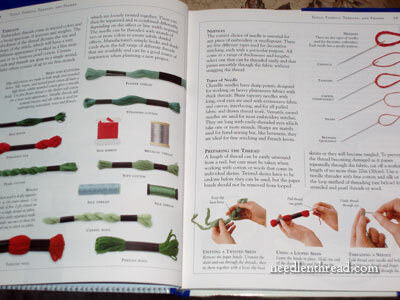 There are lots of things I like about the book, and maybe a few drawbacks, but overall, a handy little visual reference for stitching. My copy of the book is the “old” edition – this particular edition being replaced by a new edition that has a different cover, but looks essentially like it’s the same exact book, with the exception of a broader introduction to embroidery in the new book. 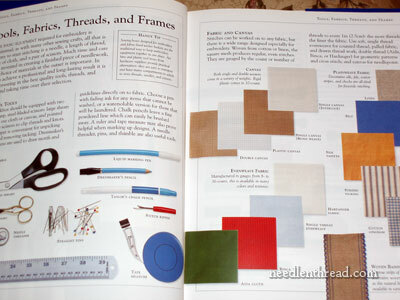 In the beginning of the edition I have (and it looks like the new edition has basically the same information), there’s a nice section on preliminary considerations for embroidery, including a good spread on fabrics suitable to needlework. This is followed by a spread on embroidery thread, mostly focusing on commonly available cotton and metallic threads, with a tiny bit of info on silk. There are photo instructions on how to separate embroidery skeins and strip floss, and some points on selecting the right needle. 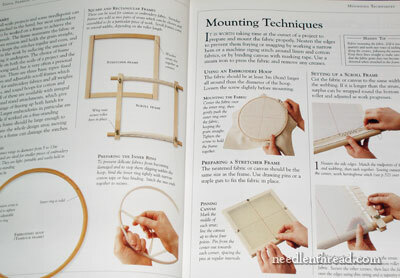 The information on hoops and frames is good, along with how to mount your work in a hoop or on a frame. Stitching techniques are discussed, like how to start and end threads and how to hold your work, whether you’re working “in hand” or with a hoop. After the basics are covered, we get to the Really Fun Stuff. I have to admit that my favorite parts of Stitch Sampler are the colorful and vivid divisions between each section (I love the neat rows of stitches) and …. 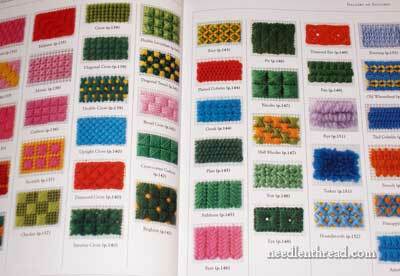 … the “gallery of stitches” – which is really just a visual table of contents. All the stitches are listed with a photo and the name of the stitch, along with the page number where you’ll find the stitch instructions. … and I can’t really explain it, but just browsing over this gallery section makes me happy! Is it the array of color? The crisp images? Or just the plethora of stitches? Beats me! But it’s downright cheery to look at! 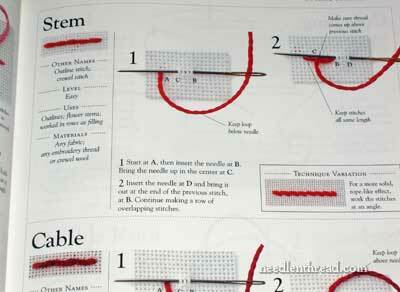 I’m always drawn to stitch dictionaries that have a visual index. I like being able to pick out stitches by what they look like. 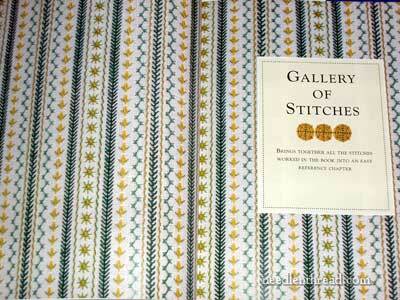 After the gallery, where all the stitches are shown in their glory, the book is divided into stitch types. Each stitch has its own little section of a page, with basic useful information about the stitch included: alternate names for the stitch, the skill level it requires (I don’t necessarily agree with all of them), the uses for the stitch, and the types of material the stitch works well on. The instructions are given as photos of the stitch in progress, as well as text instructions explaining the main movements to create the stitch. 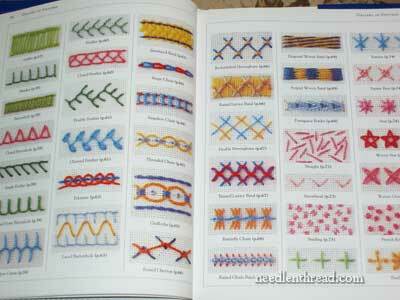 For many of the stitches, technique variations are also included. 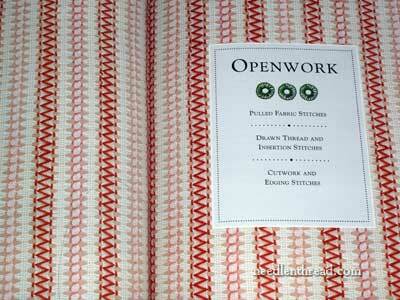 There’s a nice section on “open work” (pulled thread stitching, but not drawn thread). And there’s a fairly thorough section on needlepoint (canvaswork) stitches. 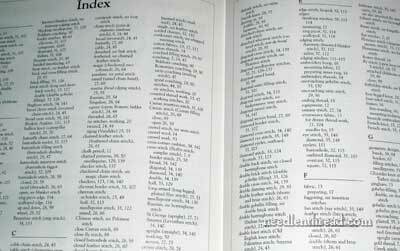 Finally, at the end of the book, there’s an alphabetical index, in case you want to look the stitches up by name. Stitch Sampler is a nice, simple stitch dictionary, very clean in its presentation, nicely bound, colorful, and instructive. 1. Some of the skill levels seem a bit askew. For example, it seems that most of the composite stitches are listed as “intermediate” and beyond, but in reality, they are fine for beginners. 2. A couple of the alternate names given I don’t necessarily agree with. For example, “outline stitch” is listed as an alternate name for “stem stitch.” But hey – this isn’t the only place I’ve seen that. In lots of old books, there is no distinction between outline stitch and stem stitch, and often, the stitch called stem stitch is illustrated as outline stitch, and visa-versa. So that’s not that big of a deal to me. 3. All of the stitches are demonstrated and illustrated on even-weave fabric, which might give the impression that they are all even-weave stitches. This is actually clarified in most of the directions, that the stitch can be worked on plain-weave or even-weave, etc..
Really, the first point is really the only thing that bugs me a wee bit, because I would hate to think that beginners would not tackle a composite stitch just because it’s listed beyond the beginner level. Most composite stitches are pretty simple – they just take more steps. But more steps don’t necessarily require a higher level of skill. Overall, though, the pros of this book outweigh the (rather insignificant) cons. The book is a little gem of a book. It’s a handy reference, and it’s very affordable. So if you’re looking for a stitch dictionary that’s affordable, readable, instructive, and fun to look at, you can’t really go wrong with this one! Stitch Sampler is now sold as Embroidery: A Step-by-Step Guide to over 200 Stitches, published by DK. You can read about the various titles of this book here – but I promise, it’s the same book! In the US, you can find Embroidery: A Step-by-Step Guide… here through Amazon. Worldwide, with free shipping, you can find the same book available here through Book Depository out of the UK, where it is published as Embroidery Stitches Step by Step. This does look like the perfect book for a sampler, Mary. Thanks for the comprehensive review. Can’t wait for the giveaway. this book is really a good one for reference..I too liked the array beautiful array of colours with neat stitching..as I am always not sure of stitch names I usually refer yours and Sharon’s stitch dictionary..
who is the lucky reader who will win this book!! I have this book with the “old” cover translated to Portuguese. Like you I feel happy looking at this book. So colorful 🙂 and you can learn a lot of stitches just looking at the photo instructions. The stitch gallery is so colourful and beautiful. I’ve seen that book, thought I had it but I don’t. Drat! My favorite part of the book is having the pictures of all the stitches in one place. Kind of like a table of contents of just stitches. So much easier to browse that way than flipping through 200 pages looking for a stitch. I’m going to have to get this one. I was given, I believe, the new version of this book – it’s called ‘Stitch Dictionary’ now but it’s the same book. It’s THE best stitch book I’ve ever laid my sticky little paws on. Love it. I recently checked this book out of the library and loved it so much I added it to my birthday list. I thought it was super as well, especially the thumbnail photos of all the stitches. Thank you for writing such a great review. I also have this book and it is the best one I have ever seen. I have had it for awhile and use it quite frequently. 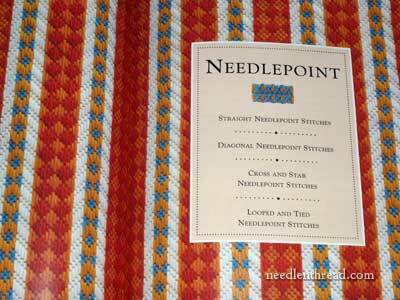 It is especially helpful when looking for what type stitches to choose for use in a project. I highly recommend it for beginner and advanced stitchers. MEMEMEMEMEMEMEME!!! I want it! I want it SOOO BADDDDD!!! Seriously (and much more calmly), that is one that I keep my eyes open for when I hit the used bookstores. I really, REALLY want a copy of it. That visual index is almost worth the entire book! Phew, what a busy time for me.I read all your posts but lately is as far as I get. You pulled me up short with this review though. What a beaut book for its illustrations. It’s a pity about the skill level problem. No issue to me but, like you, I’d be sorry to see beginners put off (or become bored with basic stitches) and give up. The lines of samples, is mainly the first one you’ve pictured, reminds me of the small bag in Inspirations mag #13. It’s also on the cover, and the whole bag just inside, the A-Z of Embroidery Stitches #1. Espero con mucha alegria su regalo. 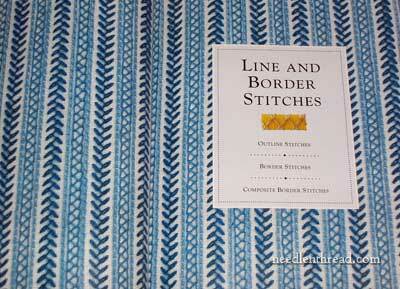 Another fabulous giveaway for someone’s stitch library. The stitch gallery is so beautiful. Your contribution to embroidery is wonderful. 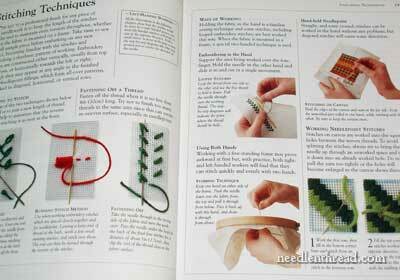 Your web site is a great resource for all of us who love the needle arts. Hi Carol – thanks for your comment! That applies only to stem stitch when working it away from you, or from bottom to top. If you are working towards you, or top to bottom, the thread is to the left of the needle. So it always depends on your stitch direction, and sometimes, it also depends on the type of thread. Since most common embroidery threads are s-twisted, this applies, but for those types of thread that are z-twisted, then it’s the opposite. 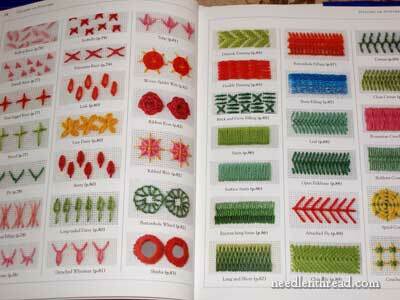 I own the “A-Z OF EMBROIDERY STITCHES” BOOKS 1 & 2. 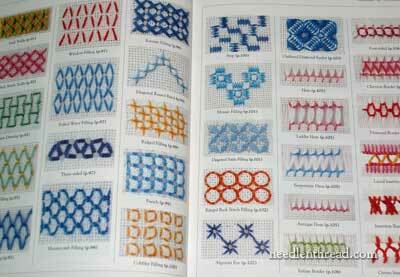 Do you think that the “Stitch Sampler by Lucinda Ganderton” would be an addition to my knowledge? Yes, Shaz – it has quite a few more stitches in it, in different categories. I love how you have shown this book. DK publicatuons have great visuals. Is this book still in print ? 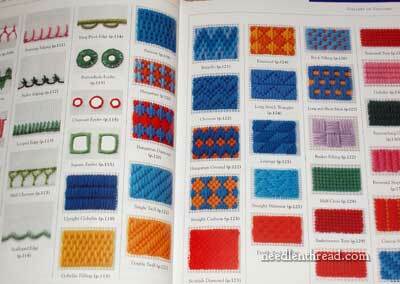 Just bought the paperback Embroidery book and found it IDENTICAL to my hard cover Stitch Sampler. In researching, it seems several titles hold these 216 pages with different publication dates. 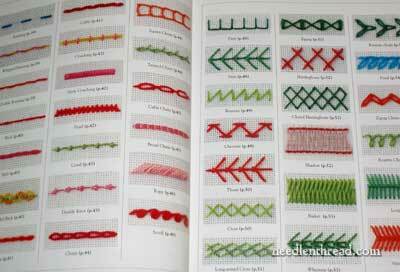 Now it is known not to buy Lucinda Ganderton’s Stitch Dictionary, or Embroidery Stitches Step-by-Step books. I do wish I had researched this beforehand. Live and learn.